I humbly apologize if I failed to make it to your blog last SSS to read your snippet. Last Sunday I was unexpectedly slammed with work, and stayed busy throughout the rest of the week. I'm combining two posts into 1 today, my Six Sentence Sunday Snippet, and my results for Saturday's #OctMadWrite challenge. Now on to my Six Sentence Sunday snippet. Once again, I'm posting from my YA manuscript, DWARFED, which is so titled because the main character, Grace, is a spunky girl with achondroplasia, a type of dwarfism, who's trying to adjust to life on a Midwestern hog farm. This week's snippet picks up where last week's dropped off. I do apologize, it ends in the middle of a paragraph. You can enjoy more snippets from the great collection of writers participating in this week's blog post visit the official Six Sentence Sunday sign up sheet. "If" can be such a big word for only two letters. You also reminded me of just how lonely it can be even in the middle of a crowded room. You covered so much in just six sentences. Nice job. Ohhhh, that's so sad. She's definitely drawing comparisons. This one really tugs at the ol' heartstrings. I sure hope the little piglet lives. Great six (again!) (btw--"can bottle 'feed' her", not 'feeding'). It's so true that the runts often go off on their own or are pushed away from their mothers. Great to include that detail. Nice six! She really identifies with the poor little piglet. Sad and yet beautiful too. Your snippets always make me feel like I'm back on the farm. Great six! I think for a moment she is in the piglet's place. Great illustration of the emotions and the overall scene. I hope the piglet lives. Emotional six! Works as an emotional segue to thoughts of her parents. I think Grace is forming a bond with that piglet. Now I'm really wondering how it works out! Might I make a couple suggestions? This part "we can bottle feeding her, and hope we get enough into her to get her weight up to where it should be" ought to read "we can bottle feed her" I think. And there's something about the two "get"s that seems slightly less polished than the rest of the snippet. Maybe just drop the "hope we get enough into her" part? I really hesitate to critique dialogue but that stuck out to me. I like your style and your characters are definitely memorable. This continues to impress. Poor Grace. this is a really tough introduction to the apparent brutalities of animal husbandry. Love your pictures too. That's an annoyed little Tamworth, assumming it's not 'shopped. 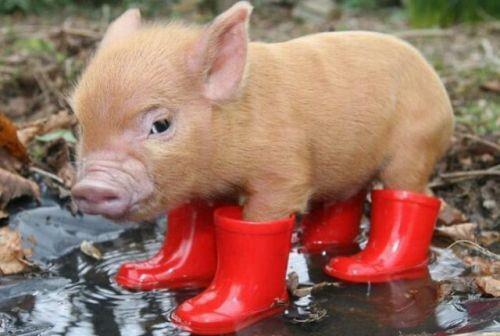 Pig in boots. That's so adorable. And your sentences are wonderful, too. Ah, I feel sorry for this piglet. You have such a way with conveying so much emotion in few sentences. LOVE that piggy photo! Love how you've connected Grace and the little piglet. So much emotion so well conveyed. Another heartrending six there, and another adorable photo too. Thanks, I'm fairly certain the piglet in this picture is a potbellied pig, rather than a farm pig, but it's so adorable, I just don't care. OK, darling photo there! Enjoyed the snippet, I'm hoping the piglet fights successfully to live...can't wait for more! Awww, poor little piggy! I hope the piglet manages to get better! I love how much empathy she has for the piglet's situation and how it connects to her own self-image. Another great six! Bottle feeding won't make up for the lost colostrum, and if the piglet's been allowed to go more than 24 hours without it, nothing will. But I love how she applies the piglet's situation to her own. Beautiful job conveying the fear and sadness in her, and in conveying the plight of the piglet. Nice work as always, Jess! Beautiful six with a great turn at the end. And I love the piglet in boots!